Our Naples cruise port guide offers information about your docking location, cruise terminal facilities, transportation options and lots more! Welcome to the Naples cruise port guide. Naples is a city of 3,1 million inhabitants. It is one of the largest cities in Europe and one of the oldest in Italy. It has more monuments, churches and convents in its historical centre than any other city on earth. It is not for nothing that the entire historical centre is on the UNESCO world heritage list. It is a gem to explore, from the busy shopping streets of La Toledo to the typical streets of the Spanish quarter. It seems like everything is a little bit more extravagant in Naples. Its city is just a little bit older, more artistic and more delicious than the rest of Italy. Find the finest pieces of archaeology and art in its museum, go on the search for the best margarita pizza and take part in street life in Naples. But it is not just about the city in this port of call. Don’t forget that this is the gateway to Amalfi coast, Pompei, Herculaneum, Capri and Sorrento. From ancient excavations, to world famous scenery, to the old city of Naples. There is always something new to explore not far from the ship. 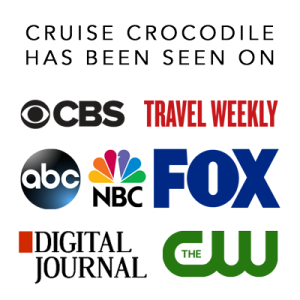 Check the cruise travel guide underneath to learn about your options. 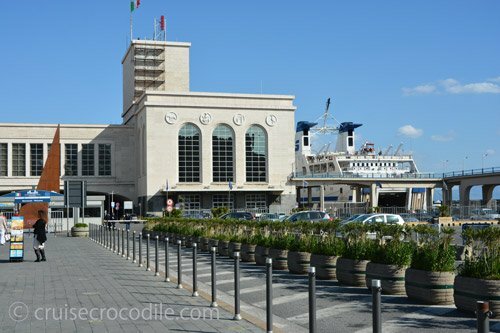 This is the beautiful cruise terminal of Naples. Inside you’ll find facilities like wi-fi, souvenir shops, post office and tourist information. There is wi-fi at the snack bar inside the terminal. 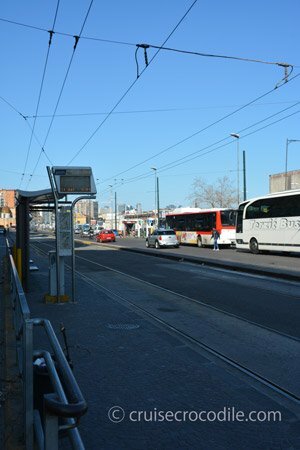 In front of the terminal you’ll find a crossing where you can catch tram 1 and bus 151. Both of them go to the Garibaldi station where you can pick up the train to Pompeii and other destinations. In front of the terminal you will find a sign like this with the taxi prices on them. It is always wise to first check this one before making a deal with a taxi driver. When traveling with bus, tram and/or train you need to get a ticket. 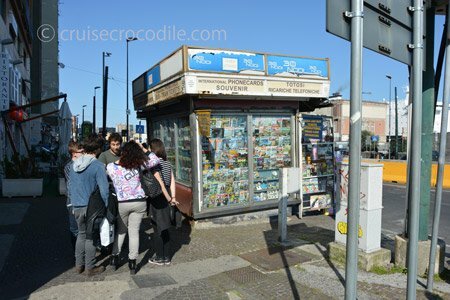 This kiosk on the crossing in front of the terminal is where you can buy all your day and single cards for public transport. If you mention you are going to Pompeii he will give you one ticket valid for bus/tram and train. Cruise ships dock at Naples Stazione Marittima. 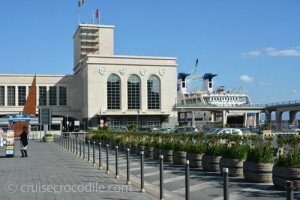 The cruise terminal in Naples is right in front of the city centre of Naples. From here you can easily explore the city by foot. The cruise terminal has all the facilities you could want like post office, tourist information, shops, wi-fi etc. Naples Circumvesuviana This is the name of the train that goes from Naples around Mt. Vesuvius. You can reach all of the mayor Vesuvius excavation sights with this line. The trains go frequent and are cheap. 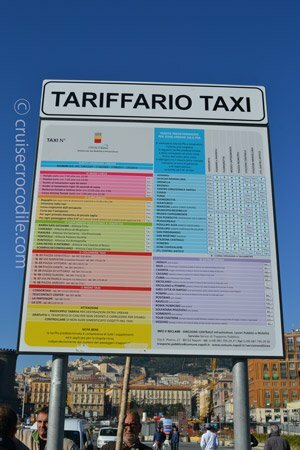 Go from the cruise terminal to the train station Napoli Garibaldi by taking tram 1 or bus 15, walk 2,5 km or take a 7 euro taxi ride. Pompei – scavi villa misteri = Pompei. Train ride takes +/- 35 minutes. Station is 200 meters from the sight. Ercolano Scavi Station = Herculaneum. Train ride takes +/- 16 minutes. Station is 800 meters from the sight. You can even go further afield with the train to Sorrento for example. This train ride takes just over an hour. You will find the red dubble decker busses in Naples close to where you dock. There has been a lot of construction work at the door step of the Naples Cruise Centre and therefore it could be that if you don’t see the bus right away it leaves from behind the castle in front of the cruise terminal. The bus only stays in Naples and it is wheelchair accessible. Capri = 43 km south. Can only be reached by ferry. Spaccanapoli means “Split Naples” and this is exactly what it does. It is a perfect straight street and it runs directly through the historical district of Naples. Walk it from begin to end to come across the most famous monuments, churches and sights of the city. At just about 30 minutes drive from Naples you will find one of the most famous excavations in the world. This ancient city got covered in ashed after the eruption of Vesuvius in 79 AD. The archeological site is something remarkable and not to be missed. Be sure to bring (audio) guide to get a picture behind the ruins. This is the main church of Naples from the 11th century. If you were go for lunch at the Earl of Sandwich you order a sandwich. If you go for lunch in Naples you order a margharita pizza. This is the place where pizza was invented in the 16th century. Later in 1889 the Margherita pizza was invented when Queen consort of Italy, Margherita of Savoy, visited Naples. Especially for her they made a pizza that resembles the colors on the Italian flag. Blessed with the title “World’s best pizza” and straight out of the blockbuster movie “Eat, Pray, Love” with Julia Roberts this place must be the most popular spot in Naples. It is a tiny pizzeria where drinks come in plastic cups and pizzas only come in margherita or marinara. Keep in mind there might be lines, but you always have to option on going to the pizzeria across the street. This square forms the centre one which a lot of the most important buildings of Napels are located on. Make sure not to miss this part of the city. It is named for the plebiscite in 1863 that brought Naples into the unified Kingdom of Italy. In front of the cruise terminal you can already see one of the eye catchers of the city: Castel Nuovo. It is a medieval castle that distinguishes itself by its architecture and history. Take a look inside the castle and visit its museum. Cruise ships dock at the Naples cruise center. This cruise terminal is located right at the center of town! There are lots of things to see and do within walking distance. 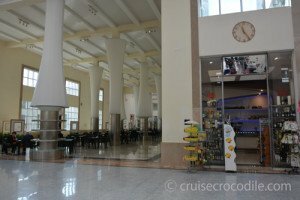 Find souvenir shops, tourist information and ATM’s in the cruise terminal. 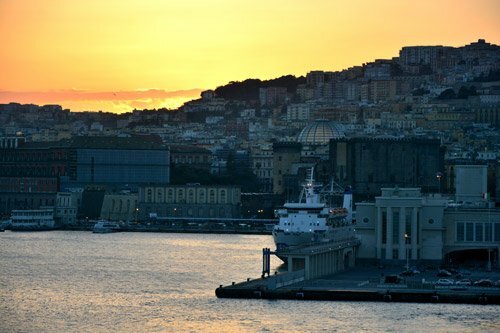 Visit the full Naples cruise port guide for all the information. If you are going shopping this is a spot not to miss. In the middle of the shopping district you will find this beautiful gallery. It is a public shopping mall from 1887. Why not start any shopping trip in Naples here? At one of the random picturesque squares (Gese Nuovo square) in Naples is where you are going to come across this unusual gothic structure. You will find the church of Gesú Nuovo, church of Santa Chiara and the spire of the Immaculate Virgin here. On the Via San Gregorio Armeno you will find “Crib makers street” (see map). Visit this street to see the nativity scene makers at work on their Neapolitan Crib. This happens year round although during Christmas more than half a million tourist come to see the shops with the original miniature figurines and the shops. Just north of Via Toledo you will find the Sqanish quater. This among the locals in known as the area suffering from high unemployment, but to many it also doesn’t get any more typical than this. Just looking at this picture already you see this is the Naples as you had envisioned it. Naples has 4 castles. On top of the hill lies the “baby” castle. It is a star shaped military fortress on top of the Vomero Hill. Visit the castle and have look in its Novecento museum, High Prison and collection of modern art. This picture was shot while sailing out of Naples. It shows the city’s beautiful skyline and its cruise port. But this is not the only thing to see when sailing in and out of Naples. Your ship will also be close to Mt. Vesuvius and the island of Capri. Keep an eye outside when sailing in and out and keep your camera ready.